"The new album from Gino Foti, Xenosonic Journeys, is yet another foray into the world of MIDI, synth, bass guitar, and keyboard music. There are reflective, upbeat, and contemplative songs mostly in the experimental, new age, world jazz, world fusion, and electronica genres. There are twelve tracks in all with many multiple sub-themes within each song. Gino is a Sicilian-born multi-instrumentalist with a repertoire of bass guitar, MIDI bass guitar, keyboards, synths, loops, and samples to his credit, while he is joined by Dave Kulju on electric guitar, Massimo on V-drums, and Sri Sastry on vocals. “Ten Directions” opens with ambient flutes and electronic washes that imbue the sound with new age realism. However, there are blurby percussion sequences that begin after the ambient opening ceases. The South Indian-like percussion style is backed by ruddy bass and electric guitar drones. The hearty, seven-plus-minute song does not contain vocals. There are a few breathy flute renderings and ambulating percussion sets that keep the song moving along with new age and fusion grandeur. “Latitudes and Longitudes” begins with abrupt bass and electric guitar sounds that are joined with percussion in a sort of contemporary jazz and experimental rock solo. The instrumental piece is permeated with squeals of electric guitar power and jingly bass with echoing percussion. The electric guitar showcases some inner strength mid-song. There are some electronic blurbs and samples that provide a more contemporary approach to the mix in an almost dance form. There are some experimental rests that create a few instances of silence, but that only intensifies the music. Think of 1980’s Tangerine Dream with late-guitar-whiz, Shawn Lane. “Saraswati” opens with a laser-like medley of atmospheric sound that is highly electronic in tone. The majestic tone is accompanied by indiscriminate, but clearly Hindi-inspired vocalizations. The rippling guitar and bass accompany earthy percussion that sounds very acoustic and raw. The free-floating vocals showcase world fusion at its finest. The rumbling bass, scintillating guitar, and heavenly vocals are unmatched. The modern musical conglomeration is ripe with South Indian, folk, experimental, and world jazz elements that are not deficient in any way. “Measure Of The Universe” opens with an electronic woosh and piercing static of electronic noise that summons a far-off galaxy. The sound subdues after beeping, grinding, swishing, and deep drone sounds appear. A slow, drum dance beat becomes louder. The new sound is accompanied by bass and swishy dance beats that incorporate a few piano solos and percussion displays. The industrial noise is punctuated with a blend of world jazz that is never boring. The electronic bass sounds are quite fluid, punchy, and always energetic. This is another stellar track incorporating a variety of musical genres and styles that seem to work very well. Gino Foti’s new work, Xenosonic Journeys, provides a musical soundtrack for the sounds of the world from an electronic, jazz, experimental, and cross-cultural point-of-view. The twelve tracks represent mostly instrumental music that is only briefly interrupted with vocals of any kind on two tracks. The instrumentation and arrangements are diverse enough to provide a varied listening experience that is very satisfying and beautifully-executed. The incorporation of dance and electronic elements make the songs shimmer with new age delight. If you are seeking sleepy or dreamy new age fanfare, then this is not your cup of tea. Importantly, there are quieter moments, but nothing too slow. This is a great release that mirrors the work of early Tangerine Dream, Shawn Lane, Jonas Hellborg, and Enigma. However, if you enjoy world jazz, improvisational, experimental, progressive, and electronic music, then Xenosonic Journeys is right up your galaxy! Buy it today!" 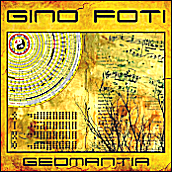 "The fifth solo album from bassist/composer Gino Foti finds him in similar territory to his earlier work but with a more varied palate, incorporating influences from his group Electrum as well as a little Weather Report - among other things. Foti's playing is fluid and imaginative recalling Michael Manring's solo work as well as obvious comparisons with Jaco Pastorius. Electrum bandmate guitarist Dave Kulju makes a guest appearance as well. Foti plays all manner of basses, though mainly fretless, as well as synths, piano & percussion. The result is an album of superb playing and highly melodic & interesting compositions. This is a bass player's solo album that is not just a chops-fest, though if you come to be amazed by Foti's technique - amazed you will be! Highly recommended, and not only to bass players!" "Xenosonic Journeys is the fifth solo album from Italian new age/jazz fusion artist and multi-instrumentalist Gino Foti. Although he performs on keyboards and sampling synthesizers, Gino Foti is first and foremost an exceptional bass guitarist. And much of his material is constructed around bass and MIDI bass guitar. He has a mastery of the fluid fretless bass on par with jazz contemporaries like Mark Egan and Percy Jones of Brand X. And Foti incorporates various configurations of fretted & fretless, dry & effected, rhythm & lead into the compositions, giving the bass guitar a distinct prominence. And with the aid of guest musicians Dave Kulju (guitars), Massimo (V-Drums), and Sri Sastry (vocalist on the track “Among Sacred Rivers) Gino Foti has produced an aural travelogue of exceptional jazz/fusion with "Xenosonic Journeys" transporting the listener to mystical and exotic locations across the globe. The loosely structured compositions leave a lot of room of improvisation as Foti dabbles in a variety of musical genres including ambient, downtempo, electronica, techno, trance, jazz fusion, progressive rock, and world music. On his website Foti explains that “the arrangements were achieved primarily through three methods: symbiosis, syncretism, and synthesis. Interactions between instruments were maximized, hopefully to the advantage of all; arrays of differences were aligned, such that likeness might be found among the unlikely; and disparate elements were fused together, trying to form a coherent whole”. Throughout the recordings Foti experiments with a variety of Arabic, Middle Eastern, Asian, Latin, European, tribal, and Afro-Cuban rhythmic patterns, and odd time signatures to challenge the listener. His production skills as well as musical composition are flawless. Fans of the new age jazz/fusion band Shadowfax should find this to your liking, as well as Kit Watkins later period solo projects. Recommended for fans of such genres as jazz, global, and ethnic fusion, worldbeat, and new age."